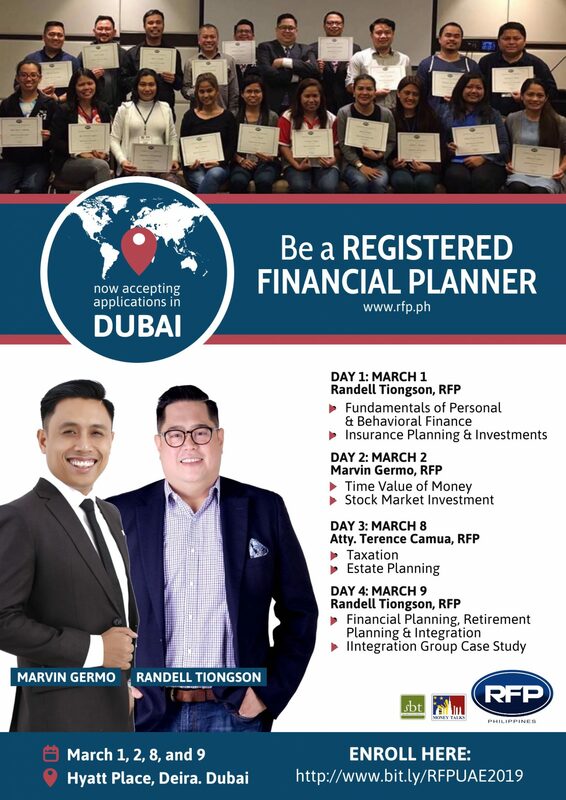 We are excited to announce that the RFP Program will once again be available for the Overseas Filipinos in the UAE this 2019! The Registered Financial Planners Philippines or RFP is the premiere professional body of financial planners in the Philippines. RFP Philippines promotes the value of financial planning and advances the financial planning profession. The financial planning profession exists to help people reach their financial goals and dreams. At RFP Philippines, financial planners demonstrate and support professional commitment to education, high ethical practice standards and client-centered financial planning process. Why should you be an RFP? 1. You can easily communicate your expertise and credibility as a financial planner. Being a RFP® certifies that you have met the education, examination, experience, and ethics requirements of the Institute. RFP®certification expresses your expertise and credibility among your peers, and clients view RFP® certification as an indication of a qualified, reliable financial planner. 2. You can enhance your career and professional growth outlook. There is a trend among large financial services firms that make RFP® certification a part of their hiring requirements for financial planning services while other companies reward achievement of the certification with salary increases. The RFP® certification gives you an international appeal that enhances your career opportunities. 3. You can become a financial adviser. As a RFP® practitioner, you will advise clients on how to solve financial issues and achieve life goals. You will help your client discover their financial needs and plan their cash flow requirements at present and in the future. 4. You can increase your earning capacity. As in any of the recognized professions, a certain level of competence is expected and financially rewarded by your employers and clients. The RFP® qualification helps you establish your competence in financial planning. As an RFP®, you can energize and revitalize your career by leveraging the knowledge and prestige associated with one of the world’s most recognized financial planning certification. Will there be anytime soon an online training for people like me who dont have time even on Fridays? How much is the course fee. May I know please how much it will cost? When you will hold this kind of training in Abu Dhabi?